The Yankees and Mets resume the Subway Series later this afternoon at Yankee Stadium. It’s a 4pm ET start. Blah. Until then, here are some stray links I had lying around to hold you over. Back in Spring Training we heard the Yankees were “confident” they could get out of paying Alex Rodriguez his home run milestone bonuses. Now that the season is underway and A-Rod is mashing taters, the breaking point is rapidly approaching. He is two shy of tying Willie Mays on the all-time home run list with 660 dingers, so it could happen any game now and trigger the first $6M bonus. According to two sources familiar with the situation, when Rodriguez goes deep with number 660, the Yankees will have a precise period of time — two weeks, as per one of the sources — to declare this as a marketable milestone. If they were to do this, then Rodriguez would sign over the rights to his image and associated branding for the price of $6 million. Once the Yankees formalize this decision, then A-Rod has a set period of time — 30 days, according to one source — to file a grievance. Though Rodriguez has shied away from publicly discussing this, every indication is that he will challenge the Yankees’ interpretation of the side deal. The Yankees will have to prove they utilized good faith in declining to declare A-Rod’s 660th homer a milestone. They’ve gone so far as to not include A-Rod in the “Upcoming Milestones” section of their daily press notes. I dunno, seems like a lot of work to save $6M. They really can’t slap together some generic AROD660 shirts, call them official, and at least break even? Besides, you know they were hoping he didn’t hit the two homers in Detroit just so they could get the attendance boost on the homestand. According to Richard Sandomir, YES Network ratings have dropped a staggering 21% so far this season, down to 267,000 viewers per game. Woof. The report is from Thursday, so it doesn’t include the last few games of this little hit streak. YES averaged over 400,000 viewers per game when it first launched and 355,000 as recently as 2012. Viewership fell to 244,000 per game in 2013 and rebounded to 288,000 per game last year thanks to Derek Jeter’s retirement. There are still 145 games left to play, so there’s plenty of time for ratings to increase, but still. That’s a big drop. I imagine it would have been even worse if a whole bunch of people weren’t tuning in to hate-watch A-Rod. New York City Football Club, the expansion MLS franchise that is doing the pro sports team version of crashing on the couch at Yankee Stadium this year, is not any closer to securing their own stadium. “We’re recognizing it’s probably going to take longer than we thought,” said MLS commissioner Don Garber to the Associated Press yesterday. ”There hasn’t been too much buzz about playing in Yankee Stadium or a baseball stadium yet,” said Garber, referring to problems with the field. ”That will happen soon, after somebody trips on a divot perhaps and perhaps misses a ground ball, but we hope that doesn’t happen.” Uh, yeah. Me too. When we first learned NYCFC would call Yankee Stadium home, it was reported they would play their home games in the Bronx for three years (!). They still need to find a stadium location, build the place, and move in. So yeah, NYCFC isn’t going anywhere for a while. They’re 1-4-3 on the season and 1-2-1 at Yankee Stadium, in case you’re wondering. They’re playing like an expansion team. Earlier this month MLB announced a new amateur prospect league will be launched in Nicaragua this summer to provide scouts with “neutral in-game scouting opportunities of unsigned prospects.” This is baseball’s second amateur prospect league — they launched one in the Dominican Republic back in 2012. The league will run until July 4th, and there will be another “season” starting in September. 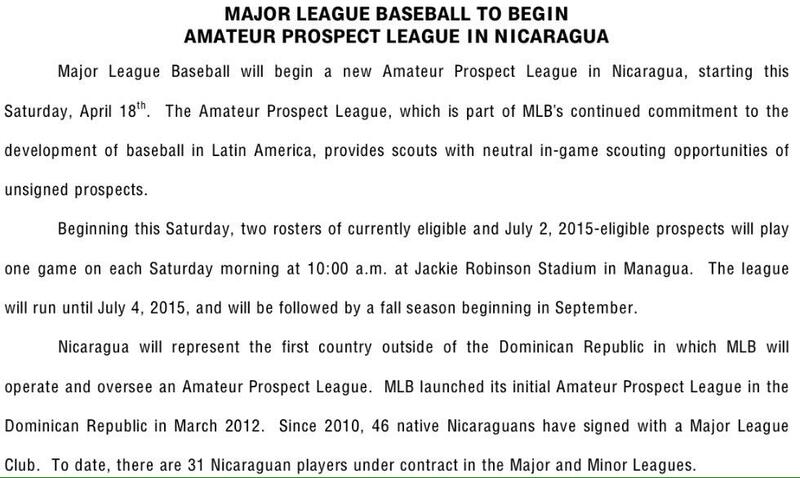 The press release says 46 players from Nicaragua have signed with MLB teams since 2010 and right now there are 31 Nicaraguan players under contract in MLB or the minors. Everth Cabrera and Erasmo Ramirez are the only players from Nicaragua in the big leagues at the moment. By far the best player to ever come out of the country is Dennis Martinez. (Vicente Padilla and Marvin Bernard are distant runners-up.) I’m glad MLB is branching out and giving young kids a chance to show their stuff. Hopefully they open more prospect leagues in other Latin American countries soon. And finally, you may have noticed during last night’s game that several Yankees are growing — or attempting to grow, anyway — mustaches. Apparently it is part of some kind of team unity thing. Marly Rivera says Mark Teixeira, Chase Headley, Esmil Rogers, Dellin Betances, Garrett Jones, and Stephen Drew are among those growing mustaches, and during the game last night it looked like Jacoby Ellsbury is trying to get in on the act as well. This is either going to be very good or very bad. Maybe a little of both. Early last year we learned Major League Soccer’s newest expansion franchise — New York City Football Club — will play its 2015 home games at Yankee Stadium. It’s believed NYCFC will also call the Bronx home in 2016 and 2017 as they look for their own stadium, but right now only the 2015 season has been confirmed. The Yankees own one-quarter of NYCFC. NYCFC announced its 17-game home schedule earlier this week, which you can see right here. The MLS schedule runs from March through October, so it overlaps with the MLB season entirely. NYCFC will play their first home game on March 15th, while the Yankees are still in Tampa for Spring Training, and their final game on October 25th, right smack in the middle of the postseason. Yankee Chief Operating Officer Lonn Trost has estimated that it will take three days (2½ in a pinch) to turn over the field from soccer to baseball. The schedule allows for three full days after every NYCFC home game before the Yankees take the field on the fourth day—save one, when NYCFC hosts the Montreal Impact on Aug. 1, before the Yankees host the rival Boston Red Sox just three days later. Then there is the matter of Oct. 25, when NYCFC is scheduled to host the New England Revolution, a date that also figures to be right around the start of the World Series. If the Yankees make it that far, a person with knowledge of the situation said, several contingencies exist for handling the soccer game, including the use of other sites, ensuring that baseball’s postseason would not be affected. Barbarisi hears the pitcher’s mound will not interfere with the soccer pitch and won’t have to be torn down and rebuilt every time NYCFC plays a game. That’s … reassuring? I am worried about the condition of the field next season, especially in the second half after it’s had a few months to get chewed up by the two sports and all the transitions back and forth. I’m also certain the Yankees wouldn’t have committed to letting NYCFC play in Yankee Stadium if they weren’t confident the field would be in good shape. They have one expensive baseball team and those players are investments they’re trying to protect. I guess we’ll just have to see how this goes as the season progresses. As expected, the New York City Football Club will play its home games in Yankee Stadium during the 2015 season, it was announced. The expansion Major League Soccer franchise was unable to build a stadium of their own, so they will play in the Bronx for the time being. The Yankees co-own the team along with Manchester City. Although only the 2015 season was announced, NYCFC is expected to spend three years total in Yankee Stadium while they secure a facility of their own. Last summer the Yankees teamed up with Manchester City to become part owners of Major League Soccer’s latest expansion franchise, the appropriately named New York City Football Club. It is the second MLS franchise in the area, joining the New York Red Bulls. The Yankees reportedly own a quarter of NYCFC and their involvement has mostly to do with concessions (Legends Hospitality) and their New York political ties. According to the New York Times, NYCFC has been unable to find a permanent home. Community opposition derailed plans for a stadium at Flushing Meadows Corona Park in Queens, and rumors of a facility between the Major Deegan and East 153rd St. have not materialized. Because of this, the club will play it’s home games at Yankee Stadium for the next three (!) years. NYCFC must secure a location and build a stadium within that time, which does not figure to be easy considering how things have played out over the last year. A Yankees executive emphasized to reporters earlier this year that a potential shared space was not a concern, saying the Yankees “realized what we were getting into” when they went into their M.L.S. partnership with Manchester City. At an event in February to announce a summer exhibition game between Manchester City and Liverpool, Mark Holtzman, the Yankees’ executive director of nonbaseball events, said the team generally required several days to prepare for events and then several more to repair the playing surface for baseball. But he also noted that since its opening in 2009, the stadium has hosted soccer games as well as a schedule of summer concerts. Obviously wear and tear is a pretty big concern. The MLS schedule runs 34 games, which means one home game every two weeks or so, on average. Back-to-back NYCFC home games and stuff like that could really tear up the field. There’s also the matter of removing and rebuilding the pitcher’s mound. That said, Holtzman and the Yankees are not concerned. “Technology has gotten to the point where I think we can turn it around pretty quickly,” Holtzman said. NYCFC will begin play during the 2015 season. An official announcement of their temporary move into Yankee Stadium is expected next week.